It was during the mid-seventeenth century English purges in Ireland that one of Cromwell's Generals, Edmund Ludlow, was famously heard to remark: "There is not enough water to drown a man, wood enough to hang one, or earth to bury him." The object of his derision was 'The Burren,' the strange, harsh, and hauntingly beautiful north-west part of County Clare. It's an environment which seems at once hostile and bleak, yet also fragile and sensitive. Known by its Celtic name 'bhoireann,' meaning 'a rocky place,' the Burren is a rugged limestone plateau, the remnant of what was a shallow sea floor some 300 million years ago. Its current unique 'moonscape-like' appearance was developed during the last ice age about 15 thousand years ago, when glaciers gouged away the soil and shale cover exposing the underlying soft limestone rock to aeons of Irish weathering. For over 100 square miles the country has been laid bare and is tattooed by fissures giving the impression of a natural ‘crazy pavement' which is traversed by mazes of low rock walls, some of which just seemingly peter out. These are the ‘famine walls' — a relief measure introduced by the English during the 1845 Potato Famine to give some employment and much needed revenue to the starving population. With the combination of these walls and the fissured limestone pavements, it almost seems as if the countryside has been turned inside-out and now wears its bony and indented skeleton on the outside. After a shower, the limestone glistens a dusky grey but quickly takes on an intense bone white hue with the arrival of the sun, but it must surely be by the light of a full moon that the Burren is at its most hauntingly picturesque. Here is a setting replete with remnants of an ancient civilization, majestic and moody castles, Celtic burial places and pagan fertility symbols. The whole region is one of the most intact archaeological landscapes in Europe, graphically reflecting 6000 years of human habitation. Stone tombs, or dolmens, over 4000 years old and the ruins of some 20 churches, constructed between the sixth and twelfth centuries, are just some of the attractions which lure archaeologists, historians and tourists from all over the world. While there may be, as Ludlow observed, a dearth of trees, there is, despite lack of soil, no absence of flowers. On the contrary, the Burren is a virtual treasure trove of flora which have taken root amongst the limestone fissures. In this small portion of County Clare, grow in profusion over 1000 plant species usually found thousands of miles apart. It is the only place in Europe where Mediterranean and Alpine plants grow together in perfect harmony as a result of climatic conditions and the high degree of light reflected by the denuded landscape. Maidenhair ferns, alpine violets, cranesbills, mountain avens, foxgloves and even orchids nestle amongst the lattice of runnels and crevices. During spring, when the flora is at its best, a display of brilliant blooms infuse this wild rock garden, making the Burren extremely popular with botanists — both amateur and professional. But because of the region's climate, there is always growth and colour irrespective of the season. The unique floral showcase has given rise to one of the area's niche attractions, The Burren Perfumery(www.burrenperfumery@eircom.net) situated just outside the village of Carron. This cathedral to the senses is Ireland's first perfumery, and here the visitor can see how, using traditional methods, essential oils are extracted, distilled, blended and bottled to make distinctive local fragrances and soaps. The Burren's more sheltered valleys are the habitat of many of Ireland's shyer mammals - stoats, foxes, badgers, hares and pine martens - with wild goats a common feature on the uplands. Those with an interest in ornithology will discover bird life aplenty. Stonechats, redshanks, yellowhammers, larks and pipits all find the fissures in limestone pavements provide good nesting habitats, but it is on the Cliffs of Moher, which form the western edge of the Burren, where the most spectacular display of birds is to be found. Rising dizzyingly above the surging Atlantic, Moher's five miles of dark sandstone cliffs are habitat to puffins, kittiwakes and fulmars, which can be seen, and heard, wheeling skywards on updrafts from the sea some 700 feet below. 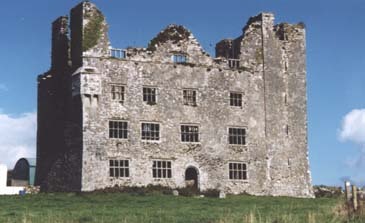 From the 19th century O'Brien's Tower situated on the cliffs, the whole grandeur of the Clare coastline, the Aran Islands, Galway Bay, the Kerry Mountains and over to the purple Connemara Hills is to be enjoyed. While most tourists make a visit during the day, it is in the evening as the sun sets in the west lighting up the rock face in its golden glow that the Cliffs of Moher are at their most majestic and inspiring. 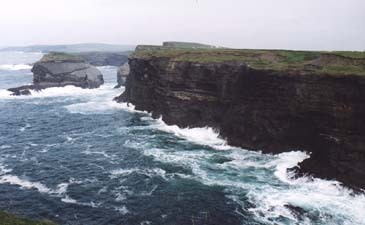 But the Burren offers a great deal more than stunning views or unique flora and fauna. As a result of its porous limestone mantle, a subterranean world has evolved. A millennium of water seepage has resulted in the formation of a myriad of caves beneath the surface, including Ireland's longest, 'The Cave of the Doves.' While the thirty or so miles of charted caves are suited to the more practiced speleologist, the Aillwee Cave (www.aillweecave.ie), near the village of Ballyvaughan, has been developed to allow visitors to safely explore deep beneath the Burren. The guided tour follows a single tunnel stretching three-quarters of a mile into the sub-strata. Once the home of grizzly bears, the cave still boasts some fine examples of stalactites and stalagmites together with a plethora of beautiful and intricate calcite formations. 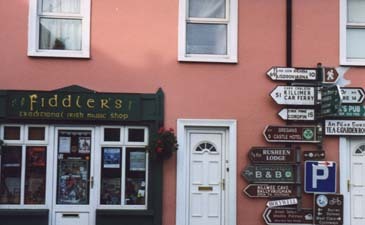 For those who enjoy walking or hiking, the Burren's austere, karstic wildness can be appreciated by taking 'The Burren Way,' a twenty eight mile, sign-posted, walking route, through the Burren National Park, which links Ballyvaughan, one of Ireland's most colourful villages to the popular seaside resort of Lahinch.